My name is Wanda Holloway. I have owned, bred, shown Arabian horses since 1970. My, then, husband and I were known as Don-Wan Arabians. Our bloodlines were mostly Egyptian. We knew pretty much all the Arabian breeders in the area. Time passed. I became single, moved North of Moses Lake in 1995. Still I had several Arabians from the former breeding program. June 2011, I was shocked to see familiar horse faces making the headlines, with pictures, in the local newspaper. The article stated that the extremely emaciated animals were impounded and turned over to Rodeo City Equine Rescue out of Ellensburg. The location from where the horses were taken was mentioned but not the name of the owner. Still, I had my suspicions. I am thinking I” know these horses”. I called RCER. Vada answered. Oh! I know you, I said. Vada had done a presentation to our horse club some years previously. She remembered me. I asked about the horses; but, she could not reveal details due to ongoing situation. I asked her to keep me informed as she could. It was a waiting game. In the proper time, the “owner” of the horses was revealed. Yes! I knew the person! I wrestled with my wallet and budget about adopting one of the Arabians. Finally I said, if one of the mares is not taken, I will do so. I could not bring another male into my little herd of three. I did not want a power struggle in my herd of one gelding and two mares. Some time passed! Babs was still at her foster home. Vada shared a picture of this cute, tiny, little mare. She was under saddle. My heart said I must have. Being a long time breeder, I knew I must have her papers. I also, wanted all the court papers. I would need them to transfer the registration papers to me. My heart cried when I saw the pictures that were taken at the veterinary inspection. Bones upon bones- Babs was the worst. However, when I went to Judy’s to pick her up she was a little fat round tub. I had not trained a horse in a while soooo decided it was best to send Babs to Jason Nagel, a wonderful horseman, clinician, trainer from Oregon. I said Jason, she must come back sweet. She did. At my age, I am more careful how and where I ride. Babs has been a gift from heaven. 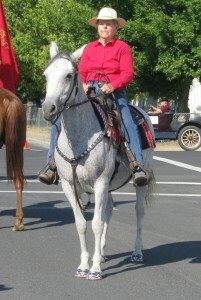 We do trail rides, clinics, parades. If she were a dog, I am sure she would be a lap dog. Babsons Dream turns 20 this year.